Five spinners that allow the user to choose the subject, indicator, province, district and municipality of the display. 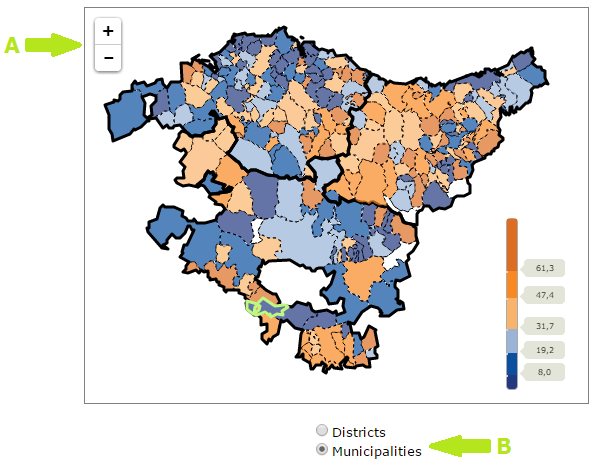 An interactive choropleth map: depending on the selection, it shows the districts or municipalities, and these are coloured depending on the selected indicator. An interactive colour legend that controls the colours of the map's areas and distribution plot's elements. Control panel for the animation and other options. Information area which shows the features of the highlighted or selected zone in the map and distribution plot. 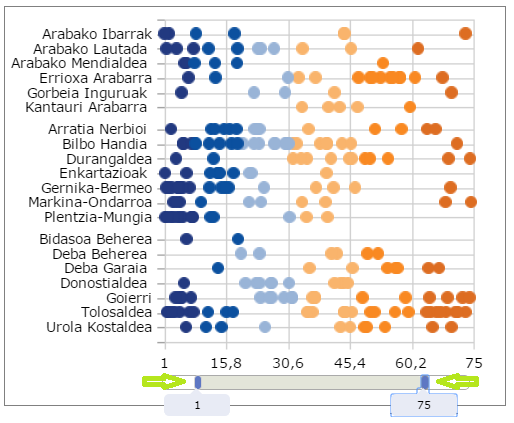 A distribution plot that shows the data of the areas (regions or municipalities) for the selected indicator. When the region data are visualized, the distribution plot shows the values of each district, grouped by province. Whereas the when municipality data are visualized, the distribution plot shows the values of each municipality, grouped by district and province. A slider that delimits the x-axis' range values of the distribution plot that is above it. Line chart of the bottom side. Besides showing the evolution of the selected indicator, it allows selecting the year of the display. Select the subject or indicator to visualize. Select the geographic area to highlight in the display. The first two spinners on the top of the screen are used to select the subject and the indicator. The selected option is reflected on all the components, i.e., on the map, on the distribution plot and on the line chart. Click on a map's area. Click on a ball of the distribution plot. Select an area on the spinner on the top of the screen. Highlight an area. While the cursor is positioning over an area, it is highlighted in green and its information is shown on the information area (if no area is selected). Position the cursor over a map's area. Position the cursor over a ball of the distribution plot. Zoom an area. It follows the same behaviour as the area selection. But it centres the map on the selected area incrementing the zoom. Double click on a map's area. In the colour legend the values are grouped into six classes using the percentile distribution of the values. Moving the arrows up and down it is possible to change the legend's values; the map's and distribution plot's colours are updated. The animation section comprises a control panel and a slider to determine speed. Play/Pause. Start or stop consecutive display of the data of the different years. Repeat. Option to restart the animation display when reaching the last year. Slider which determines speed. Bar that allows setting the display's speed. When the region data are shown: the selected region's data (maroon), its province's data (light blue) and the data of the Basque Country (dark blue) are shown. 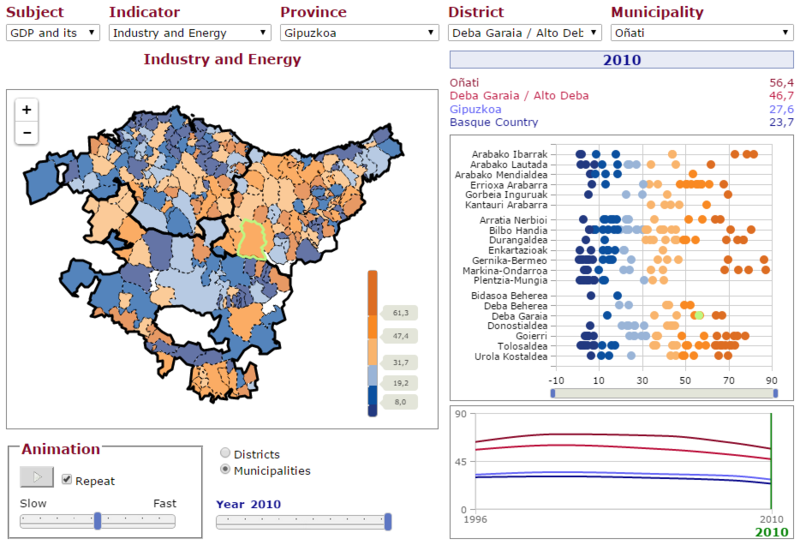 When the municipality data are shown: the selected municipality's data (maroon), its region's data (light maroon), its province's data (light blue) and the data of the Basque Country (dark blue) are shown. This slider is used to set the limits of the distribution plot above. To do so it is necessary to move the handles of the slider. When the region's data are shown: the selected region's data (maroon), its province's data (light blue) and the data of the Basque Country (dark blue) are shown. In both cases, when the cursor is positioned over a point, a dialog-box shows the values of all the represented series in that year. Using the slider bar under the map. Sliding the bar to the left or right the year of the display decreases or increases, respectively. Through the line chart that shows the evolution of the selected indicator. When the cursor is positioned over the chart, a green bar is displayed and clicking on it the display's year can be changed. In both cases, when changing the year, the data for that year are loaded. It is cross-platform, so it is possible to visualize in Android, iOS and the most popular browsers (Internet Explorer 9+, Firefox, Google Chrome, Safari, Opera). If the process takes too much time, it is recommended to use another browser, Google Chrome, for example.